• Left Click on any of the 4 arrows in the top left corner and the map will pan in the direction of the arrow. • Click on the plus or minus symbols to zoom in and zoom out. • Click and hold the left mouse button to drag the map across the screen. 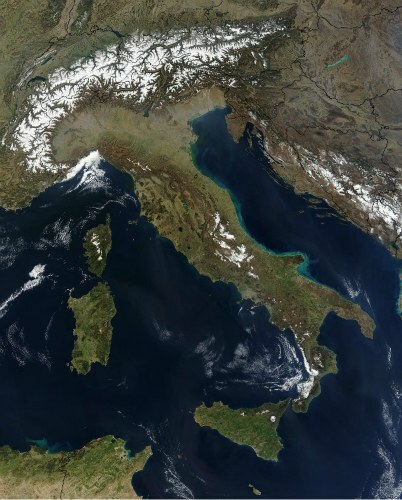 Northern Italy borders France, Switzerland, Austria and Slovenia from West to East. Italy is the only country in the World with in 2 other independent nations inside: the Republic of San Marino and the Vatican State. Italy is a peninsula in southern Europe wich includes two major islands, Sicily and Sardinia, plus other 130 small islands. 2) A peninsula that stretches into the Mediterranean Sea from north west to south east, through about 7458 km (4634 mi) of coastline and is a short distance from Croatia, Greece, Malta and parts of northern Africa. 3) An insular part with over 130 islands, which includes the two largest islands in the Mediterranean, Sardinia and Sicily, near which, at the island of Pantelleria, it has the minimum distance from Africa, about 70 km (43.49 mi). The Italian soil is partly mountainous, partly hilly and partly volcanic with the presence of low-lying areas such as the Po valley. Prevails the presence of hilly areas (41.6%) compared to the mountainous areas (35.2%), or low-lying areas (23.2% of the territory).